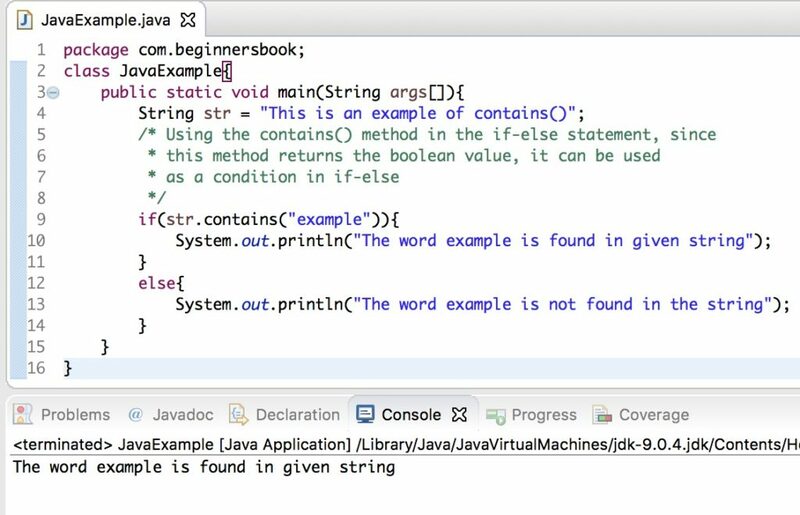 Java String contains() method checks whether a particular sequence of characters is part of a given string or not. This method returns true if a specified sequence of characters is present in a given string, otherwise it returns false. The return type is boolean which means this method returns true or false. When the character sequence found in the given string then this method returns true else it returns false. If the CharSequence is null then this method throws NullPointerException. For example: calling this method like this would throw NullPointerException. The second print statement displayed false because the contains() method is case sensitive. You can also use the contains() method for case insensitive check, I have covered this at the end of this tutorial. * case sensitive. Here we have mentioned letter "l"
* letter in the lower case. As we know that the contains() method returns a boolean value, we can use this method as a condition in if-else statement. Here we are using the toLowerCase() method to convert both the strings to lowercase so that we can perform case insensitive check using contains() method. We can also use toUpperCase() method for this same purpose as shown in the example below. //You can also use the upper case method for the same purpose.